EVE Online's foray into citizen science "the first of many"
CCP Games will continue to integrate citizen science research projects into EVE Online, following an enormously successful collaboration with the Human Protein Atlas and Massively Multiplayer Online Science (MMOS). 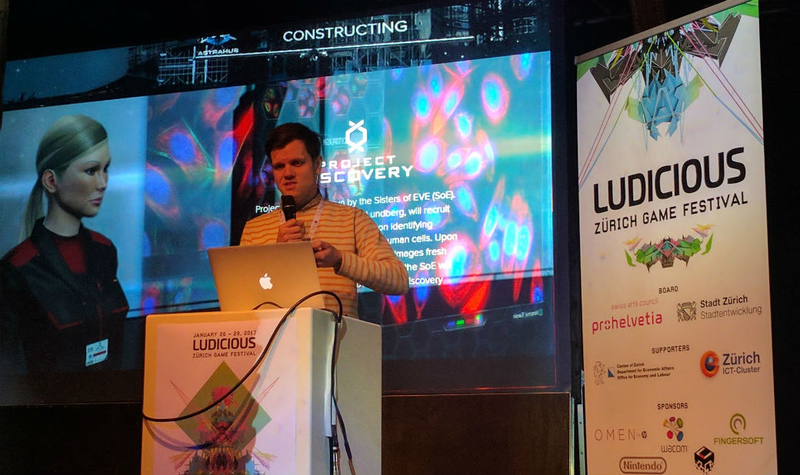 In a talk at the Ludicious game conference in Zurich today, MMOS founder Attila Szantner extolled the "beautiful concept" of citizen science, in which research processes are opened up to the public. "It is a brilliant idea," he said, "but the problem with it is long-term engagement." As an avid gamer, Szantner regarded the medium as the ideal platform for addressing that problem. Previous examples of crowd-sourced science, like Folding@home, had worthy goals, but were fundamentally dry experiences from a user perspective. MMOS could offer a new, more intrinsically rewarding approach. "We want integration with the game mechanics, with the storyline, with the visuals, and with the rewards system"
"We want integration with the game mechanics, with the storyline, with the visuals, and with the rewards system," he said. "We thought that if we did it in the right way, if we could convert even a tiny fraction of the billions of hours that we spend with games, that would mean a virtually limitless human computation engine for science." MMOS struck a relationship with the Human Protein Atlas, which had a database of more than 250,000 images of proteins within human cells, all of which needed classification to become part of its Cell Atlas. It was a huge amount of work, and Szantner believed that CCP was a perfect fit. Fortunately, CCP agreed. "You might ask why does an established, 14 year-old game take this crazy venture, allowing third-party content into a balanced ecosystem," CCP development manager Bergur Finnbogason said, joining Szantner onstage. "Well, first, we're huge science buffs, huge nerds, and we're not going to pretend anything else." Finnbogason had participated in a prominent citizen science project in the past, hunting for extraterrestrial life through SETI@home, and like Szantner he had been disappointed by the lack of meaningful interactivity. MMOS' proposal already met two of four important criteria CCP defined for citizen science in EVE Online: it had real-world, altruistic value; and the task had a consistent length (250,00 images), and therefore a defined end. The third criteria was a problem for CCP to solve: it had to fit into the EVE universe, both aesthetically and thematically. The result was Project Discovery, research conducted by the in-game organisation Sisters of Eve to discover the origin of the Drifter race, which had emerged in the game's lore a few years before. The Sisters of Eve was even led by a Professor Lundberg, who shared a name and certain physical characteristics of the Human Protein Atlas' Emma Lundberg. "We believe this is a step into something much bigger, much greater. We hope to set the example"
"We provide the frame," Finnbogason said, with CCP asking EVE's players to place a protein image into one of a group of categories, earning in-game rewards as they do so. "Once a sample reaches a specific level of agreement, we can with some degree of certainty say that it has reached consensus." This leads to the fourth criteria: the research needed a high volume of tasks, lest EVE players blow through it too quickly. "We were hoping that the whole thing would be done in two or three months, and we were super wrong," Finnbogason said. "This kind of became a problem, because the dataset was around 250,000 images, and we reached consensus on those within three weeks - of the whole dataset. "This is amazing. This is one of the issues that we deal with in EVE. Our players are just too freaking good at video games." 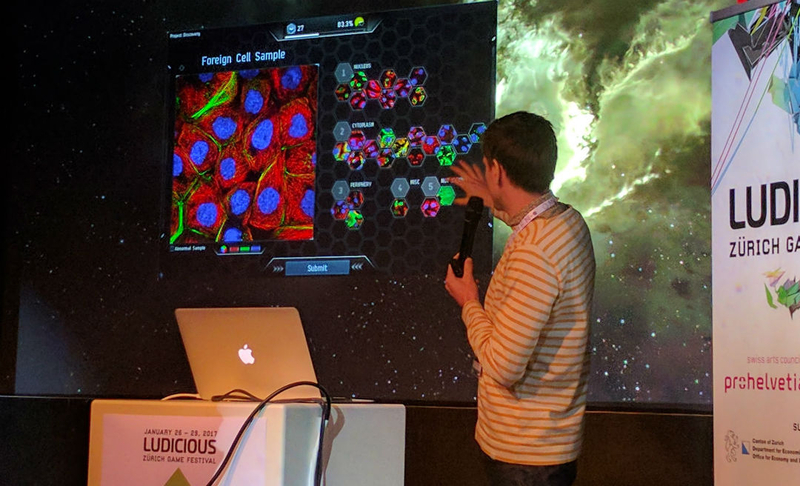 According to Szantner, ten months after Project Discovery started, Human Protein Atlas images have been classified 20 million times by 200,000 players - "huge for citizen science." The success of the project was such that MMOS is now collaborating with Gearbox on bringing a similar project to the Borderlands universe, which is notable for being a very different kind of game to EVE Online. "Theoretically, you could put it into any kind of game, even a mobile game," Szantner said, pointing out that Project Discovery was essentially a single-player experience within EVE. "I think the cooperation with Gearbox will be very, very interesting, because with EVE Online it's a natural fit. With Borderlands it's going to be more challenging, but there are quite brilliant people working there who will find an organic way to put this feature into the game." Finnbogason also said that Project Discovery may have been CCP's first foray into citizen science, but "hopefully the first of many. We'll have some news very soon about our next project." Ultimately, this was always the goal for CCP: to lay the foundation for real world science not just in its own games, both in the industry as a whole. "With the infrastructure in place, we have a lot more tools to deepen the experience, and blur the line between the reality of EVE Online and ordinary reality," Finnbogason said. "We believe this is a step into something much bigger, much greater. We hope to set the example. "We want to set the stage for many other successful collaborations between science and games to come."